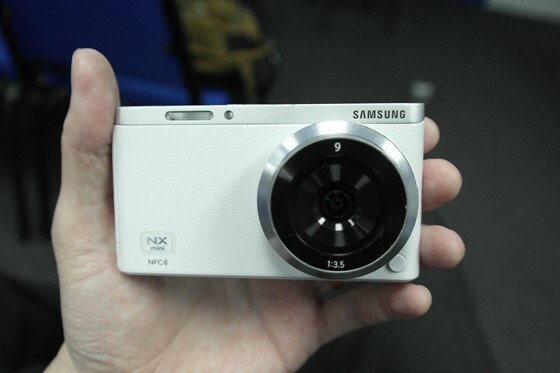 First Samsung NX mini images, specs and pricing info leaked! An hour ago DPReview forum user Jerry0619 has posted first images and partial specs of the yet to be announced Samsung NXF1 1” interchangeable lens camera. According to the presentation slides the new camera will offer a 22fps burst mode, it is however not specified whether with continuous AF or with fixed AF after the first frame. Battery life is CIPA rated at almost 700 shots (! ), which is quite amazing for such a small camera and such a tiny battery. The pancake will have an RRP of $179 and the compact zoom an RRP of $249. One presentation slide also mentions a 17mm f/1.8 standard prime, which’s pricing is yet to be determined. It is funny however, that Samsung uses a Nikon 1 Nikkor 18.5mm f/1.8 presentation image on that slide (the girl with the gently blurred background). 😉 There will also be an adapter for mounting APS-C NX lenses on the 1” NXF1, which will cost $149. The kit consisting of the 9mm f/3.5 pancake and camera will cost $/€449 while the kit with the 9-27mm zoom will cost $/€549. The pricing for the kits with either the 9mm and zoom or 17mm f/1.8 and zoom is yet to be determined. UPDATE: Samsung has officially announced the NX mini. It will be available for pre-order on April the 1st according to AmazonUS. Read the postFirst Samsung NX mini images, specs and pricing info leaked!